Once the coach driver had overcome the postcode lottery and finally arrived at college, the journey could not have gone any smoother and everybody has arrived in the hotel with their luggage, happy and ready to ski. Just one minor mishap at the airport, as one student misplaced their boarding pass. Luckily, Miss Smith was on hand to resolve the situation and everybody was able to board the plane. Mr Holden (Geography Teacher): Head in hands, gentle rocking. We arrived to be greeted by a 3-course meal that included apple crumble and custard, especially for the “Northerners”; Charlie Ball was especially happy! The ski fit ran late into the night and students juggling a set of skis, boots, poles, and a helmet, up three flights of stairs proved to be a good spectator sport. Holly Peters took Mr Holden’s prize for team work, as her ski carrying experience kicked in. Another instalment of the Unity Ski blog will follow, so keep checking in for more updates. Our first breakfast was greeted with cheers by Mr Holden and Mrs Hudson when they learnt that porridge was on the menu! The students seemed satisfied with the pain au chocolat, whilst a few were left puzzled about bread, ham and cheese for breakfast! The students then excitedly got dressed for their first session on the slopes, as fresh snow began falling from the sky. In the advanced group, the ‘Lumberjack’ award went to Ethan for his skills at chopping down stationary members of his group! Pascal, the ski instructor, was very complimentary about the ability of this group and in no time he had them at the top of mountain. The afternoon highlights included moments of near whiteout conditions, as more fresh snow fell. Some students took an interest in the local wildlife and decided to have a group meeting in a bush, Lewis Rothwell-Leah and Ethan Waters seemed to be the main leaders of this group. 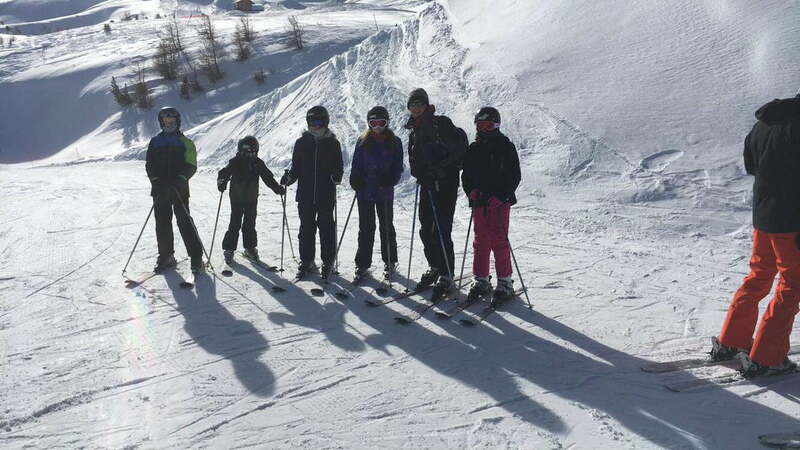 The intermediate group was large in number and set off with additional support from Mrs Hudson and Mr Hudson. Mr Hudson’s trip, and his resulting tangle with the chair lift he was getting off, brought muffled laughter from his group! They tried hard to be respectful and supportive. 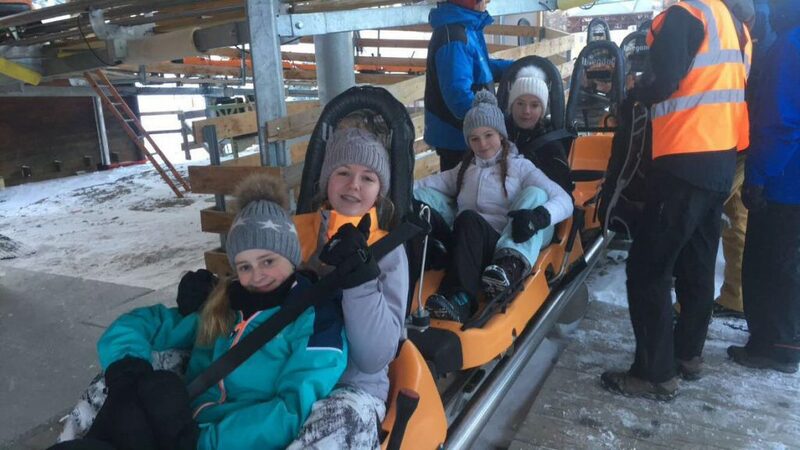 One or two students chose to slide down part of the mountain on the bottoms rather than the skis provided. The novice group got to grips with the basics and there were several frustrated shouts of “I can’t do this”, only for them to be quickly replaced with whoops of excitement as turns were linked together. By the end of the day all were snow ploughing down green runs, with bits of blue thrown in, quite an achievement for day 1. Beginners groups are now off the nursery slopes and venturing out on chair lifts to pit their skills against green runs and small sections of blue runs. No dramas for any of these students, which is a measure of how much they have come in just two days of skiing. Intermediate groups appear to have a couple of students who have become speed junkies, sadly their quest for speed has not been matched by the ability to turn or stop under control. If your watching the live webcam feed and see two streaks fly by its likely to be Charlie Brewers and Josh Baxendale! The advanced group ventured into the powder this morning and Mr Williams’ GoPro captured the results comedy of falls. The highlight being Ethan Waters leaving both skis behind and running down the slope before sliding for someway on his back! In the afternoon they ventured over the mountain into the next valley which involved two of the coldest lift journeys ever experienced even by the Ski College instructor. Charlie Ball had more falls today than in all previous trips combined, however, apparently none were his “fault”!? 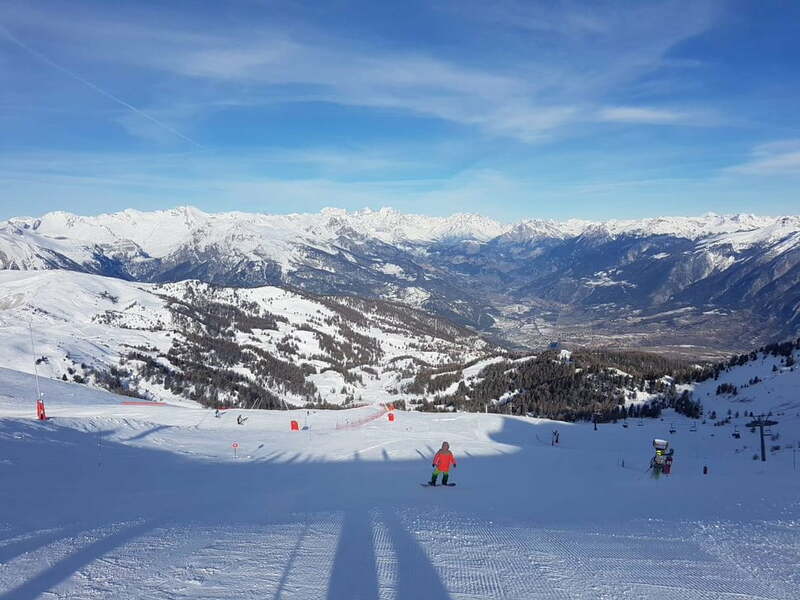 Miss Smith snapped a pole!, Mr Hudson took a tumble, whilst Mr Holden had to wear ski muppet outfit for the day; the author of this blog is not able to disclose why for legal reasons.